Hawaiian activists are urging people to contact Kirk Caldwell, mayor of the city and county of Honolulu, and demand that he stop the round-up and gassing to death of feral (free-living) chickens in Honolulu. An article in the Honolulu Star Advertiser on July 11 explains that the city has hired Sandwich Isle Pest Solutions to remove the chickens – roosters, hens, and chicks – at 70 city facilities using wire traps. The article cites a customer services director saying the CO2 gas will be applied to chickens in sealed containers "so the chickens will go to sleep and not feel any fear or pain in the euthanizing process." But as Animal Haven President Frank DeGiacomo says in the article, 'The animals will still be suffering regardless." The trapping of the chicken families is traumatic, and death in a carbon dioxide chamber does not put chickens "to sleep." Exposure to concentrated CO2 causes panic, pain, nausea, vomiting and severe respiratory irritation. Shooting cold CO2 through hoses into the gas chambers freezes and burns the birds' eyes and lungs. Chickens exposed to CO2 try desperately to escape. They take deep breaths trying to expel the gas and the sensation of slow suffocation but the deep breaths cause them to inhale even more gas. Death by CO2 is a horrible, brutal way for chickens to asphyxiate to death. 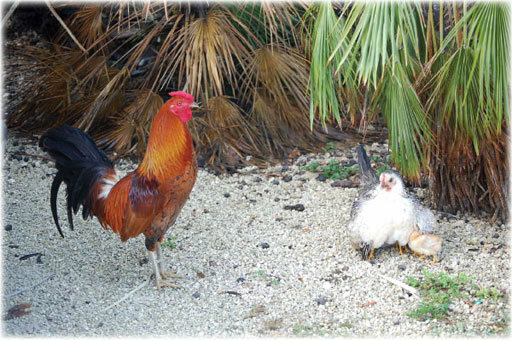 Humane Alternative According to Animal Haven's Frank DeGiacomo, a birth control bait called Ovo Control would reduce the chicken population effectively. An alert posted on ar-news notes that the city of Honolulu has been trapping chickens for over a decade "using a variety of hunters, trappers and exterminators," knowing full well that the trapping is futile, whereas birth control works. Urge Honolulu Mayor Kirk Caldwell to use birth control instead of trapping and gassing the chickens. Tell him you are outraged that his administration would trap and torture these birds to death when contraception is available for the purpose.